What a whirlwind these past three weeks have been… Flying back and forth to Toronto, I feel like I may have left my brain somewhere in the middle! I’m going to begin where I left off, which was my final day with Coco in Toronto where we walked down to Lake Ontario, which was stunningly beautiful. By the time we got back to the room, however, we were freezing, so ordering delicious chicken noodles from room service was just heavenly. By complete coincidence one of my dearest and oldest friends Molly Molloy was in town, along with my old dance partner Tim Spain – who I haven’t seen for years! Dinner with them that night was a hilarious affair, Tim cooked up a feast and we sat eating and chatting long into the night, laughing at old pictures and reminiscing about times past. The next morning I headed off to Niagara Falls and boy was it wet! Breathtaking, but wet! Once back in Toronto and slightly drier, I headed off to the theatre to watch my fellow Over the Rainbow judge, Thom Allison, who was starring in one of my favourite musicals, Ragtime. The production, Thom, and the whole cast were just stunning and I was moved beyond belief. 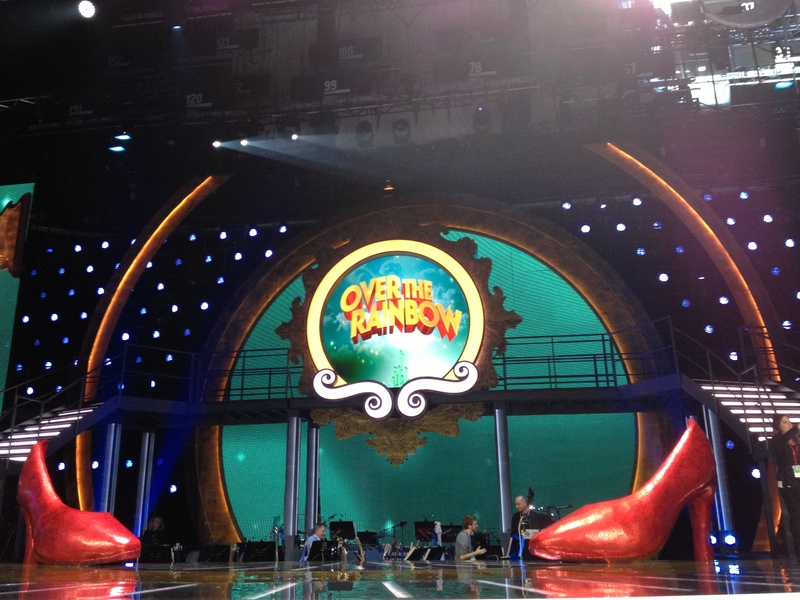 Sunday and Monday came around so quickly, and suddenly it was showtime again. We waved goodbye to Jennifer, and I waved goodbye once again to Canada to return home to my family, who I had missed dreadfully staying away all that week. Wednesday and Thursday was a mixture of meetings, all very exciting and all very different; including Starlight Express Germany, and long overdue gossip with PR and fashion guru Nick Ede. The most glamorous, of course, being dinner at Andrew Lloyd Webber’s home in Belgravia, which although a simple affair, was still divine. Friday was fun, as I always love a visit to the Loose Women. The other guests on the show with me were the adorable Olly Murs, and the supremely talented Overtones, who to my surprise and sheer delight serenaded me in the corridoor with an incredible acapella rendition of Goodnight Sweetheart. I wore a dress from my new Marisota collection, which you can check out here. Also, if you missed it that afternoon, you can see me reading the bedtime story Jack and the Beanstalk on Nickelodeon Kids @NickJrUK here. 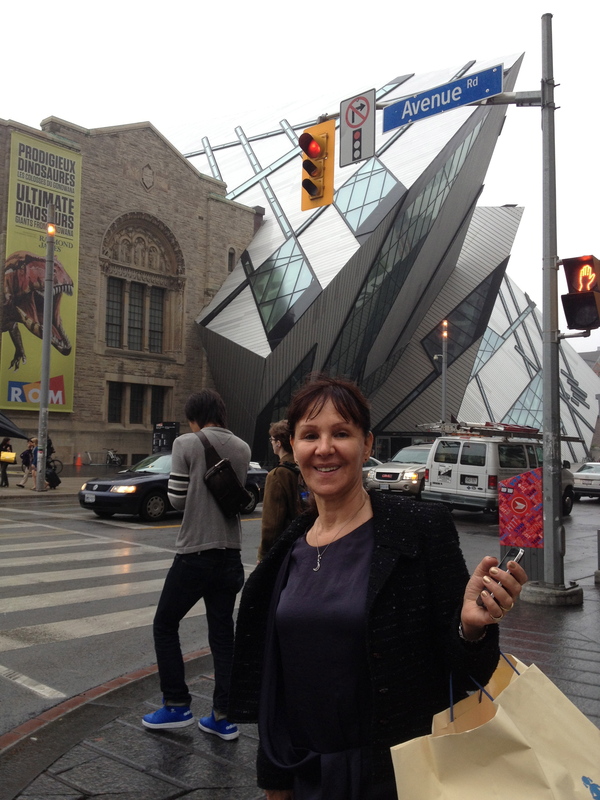 Saturday morning, and once again… yes back to Toronto! The weekend went past in a blur, we sadly waved goodbye to Jessie, and I had no sooner arrived andI was leaving again, just barely making my flight! A few things in London over the weekend incase you missed themwere my interview with Radio 3 all about my Private Passions, and the Starlight Express company performing on Alan Titchmarsh. Wednesday was a truly showbiz day, with a fabulous lunch at the Ivy Club, bumping into people left right and centre. Like director Trevor Nunn, musical theatre star Hannah Waddingham, and now international superatar John Barrowman who came flying across to my table, who I discovered was the only other person as crazy as I am to commute to Canada! However, it was the evening’s event at the Hurlingham Club in Putney that really blew me away. I was going to be presenting an award at the prestigious London Lifestyle Awards, little did I know I was going to be receiving one too! 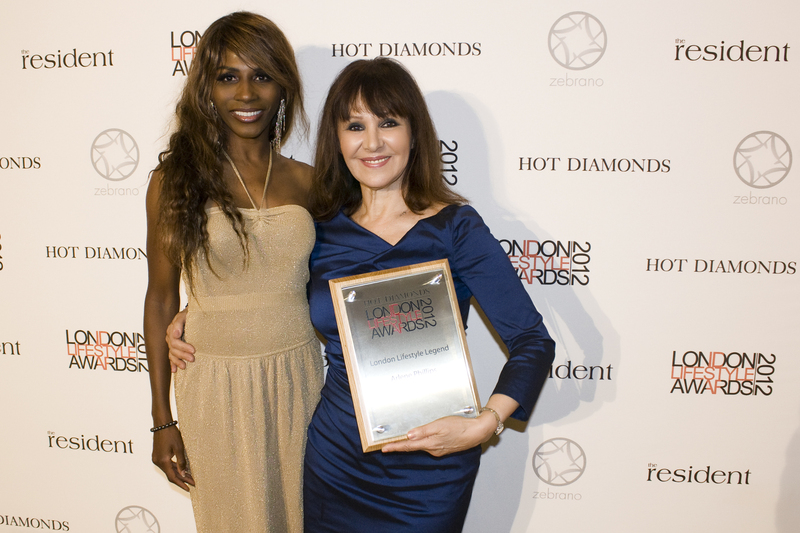 Much to my surprise I was awarded the London Legend award by my dear friend Sinitta, and I honestly was completely overwhelmed. I also couldn’t believe my family knew beforehand, and managed to keep the surprise! It was lovely to see so many old friends and faces there, including Mark Fuller, owner of Soho Sanctum and many other restaurant and clubs, whoI know from back in the crazy 80’s. 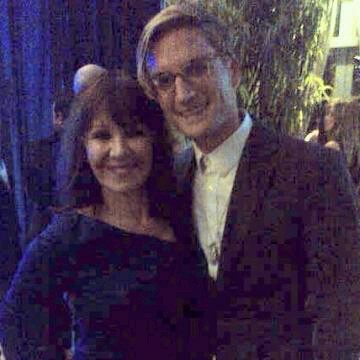 I also met Made in Chelsea’s Oliver Proudlock and we talked eyesight, laser treatment and glasses! It was a fantastic event, and one I was thrilled to be a part of. There were more theatrical affairs at the the end of the week, with Thursday being Michael Strassens’s production of Call Me Madam at the Union Theatre. It was a great deal of fun, with a brilliant cast lead by the astounding Lucy Williamson, who I haven’t seen since I worked with her on the original We Will Rock You, who took my breath away. Life really is a whirlwind at the moment, I’m not sure if I’m coming or going! This week it’s all about my adventures in Toronto, but just before I headed off for the third 3rd I managed to squeeze in a couple of things in London, starting with a meeting in town with the enigmatic Sonia Friedman, the theatrical producer – she really is a powerhouse! 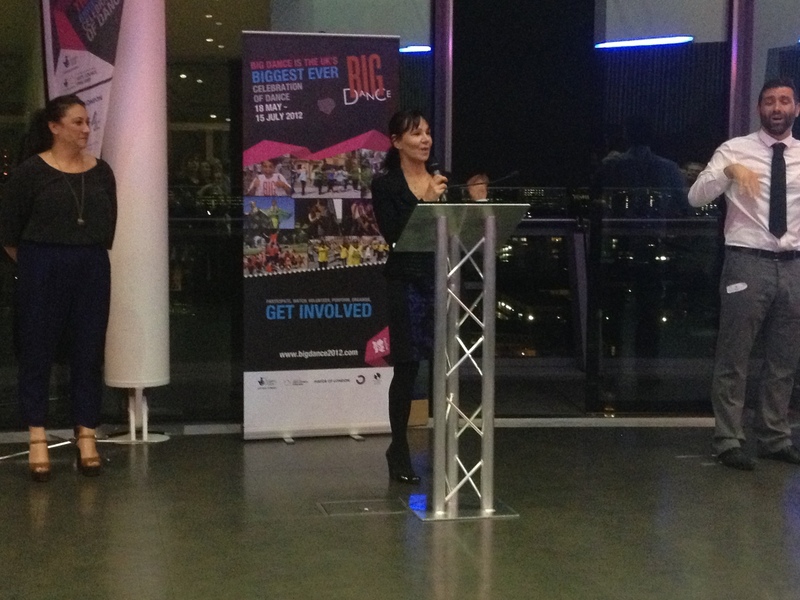 I attended a very fabulous party at City Hall for The Big Dance, where I was giving prizes to all the regional creators who helped make it the biggest dance event ever! 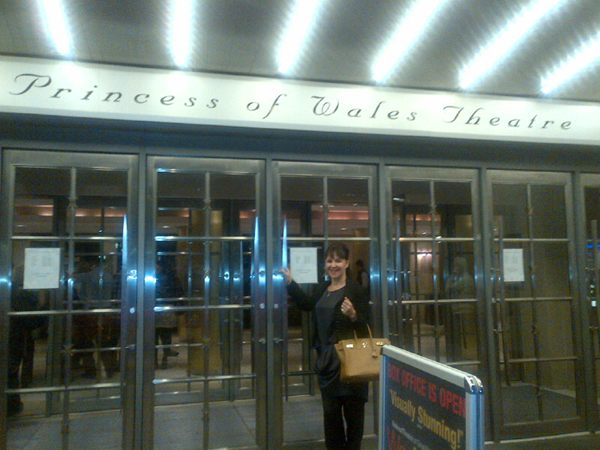 It was amazing to see inside City Hall, and I got to talk dance all night long, aah bliss! The Sunday show flew past, it was Musical Theatre numbers this week and some fabulous performances and then after I headed out for pizza with the Over the Rainbow gang including singing coach to the starts Yvie Burnett, Musical Supervisor Nigel Wright, and my dear friend and fellow choreographer Anthony Van Laast who also happened to be in town for his show Sister Act, which was opening in the week. Monday was the hard decisions of the results show, and yet every week bring us closer to finding our Dorothy… Afterwards I went for a divine Italian meal with set and costume designer extrodinaire Rob Jones, and the rest of the creative team to talk over the new and exciting changes we’re making to the show. 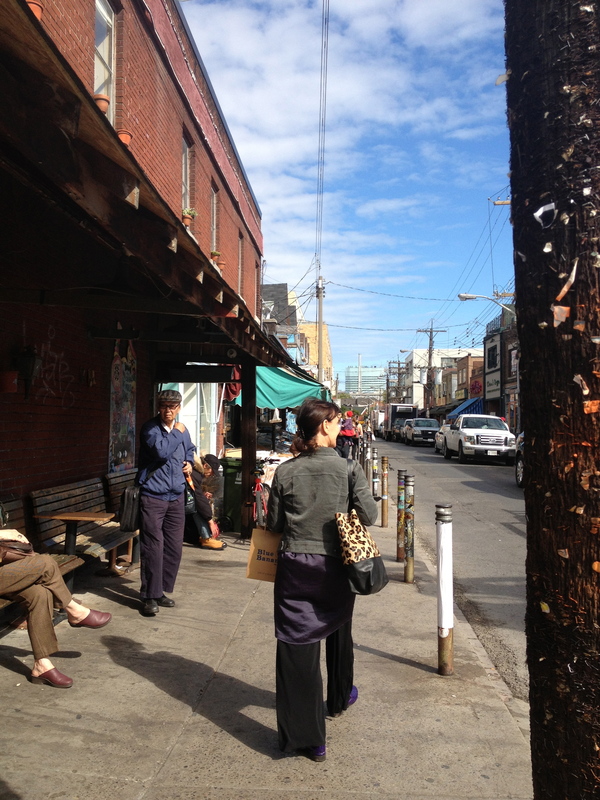 Tuesday I finally got to do some exploring with Coco, and the first place we headed was Kensington Market and Augusta street. I found some amazing vintage jackets and other fab finds in Bungalow, we ate weird and wonderful taffy, scoured up and down Queen St West, and ate the most fantastic lunch at Ban Mi Bros, that serve the most delicious Vietnamese sandwiches. I had the speciality – Tofu lemongrass and coriander with coleslaw and pickle in a bun! Trust me on this, they are too good to be true! A bit more shopping, a quick drop of the bags at the hotel and a light dinner at a lovely French bistro in the setting sun, all before the grand opening of Sister Act and after party at Baton Rouge. Wednesday morning was more shopping, this time in the glamorous area of Yorkville, and once again I find myself talking about food – but the sushi we had there for lunch was out of this world! The afternoon was spent at the costume makers Seamless, where I was surrounded by the most gorgeous fabrics in preparation for the Emerald CIty numbers. 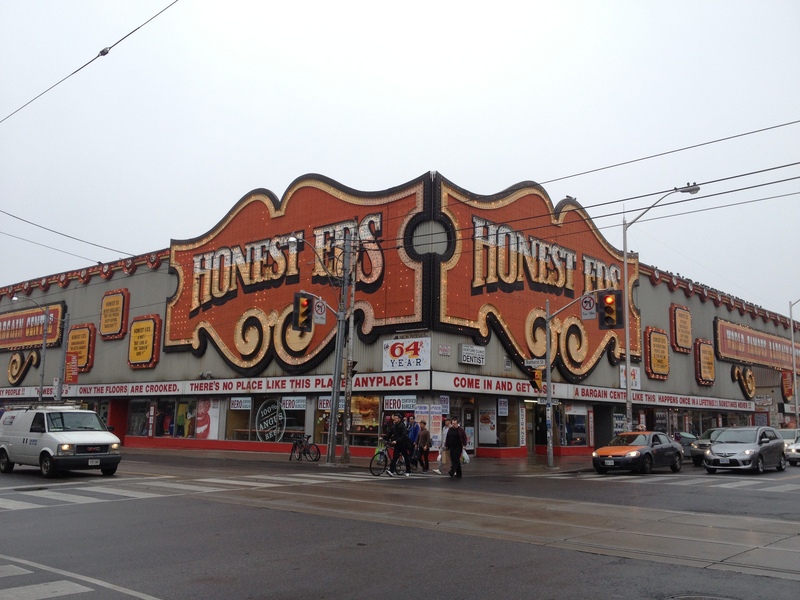 I couldn’t resist a trip to Honest Ed’s round the corner, the original pile ’em high and sell ’em cheap store, where I left piled high with bags of goodies! That evening I watched War Horse, has anyone ever watched it and NOT come out crying? It was on in the beautiful Princess of Wales Theatre where the Sound of Music was on, and is sadly about to be pulled down to make way for condominiums and an art gallery. Thursday was a race against time to get to H&M where I managed to pick up some of the Anna Della Russo collection, and then more fabulous shopping at The Bay to choose my clothes for the final shows Over The Rainbow, I honestly could’ve spent the day there! So yes I managed to shop till I dropped, and although I’ll be back in London next week, I’ll be staying out there with my girls soon and I think it mught have to be another round! 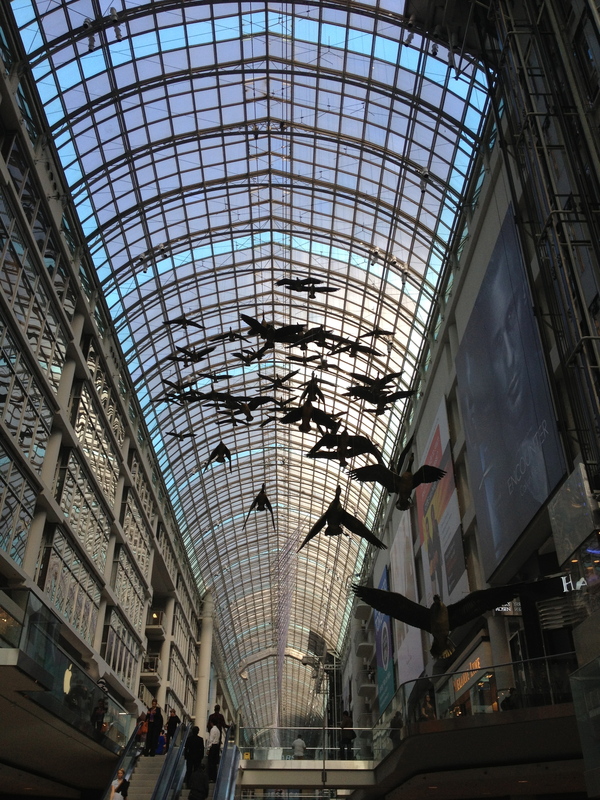 Toronto is just one incredible place to shop, eat, see, and shop round, and lucky me get’s to explore it for another month at least! 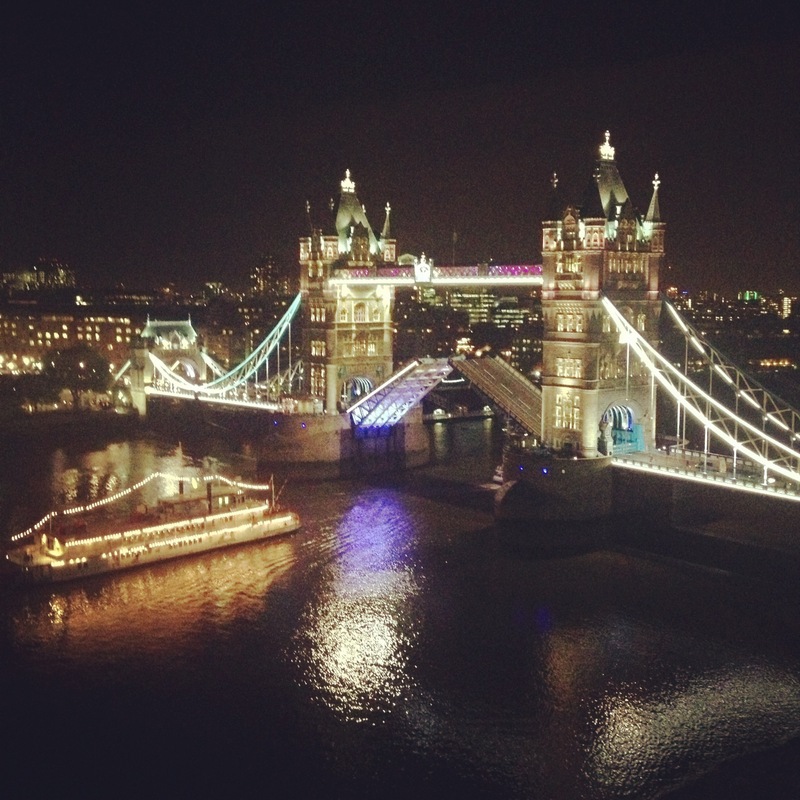 However, I do miss London and can’t wait to get back to my family, so I’ll be hopping straight on a flight after the Monday results and catching up with you all next week.